After seeing this recipe from Kalyn's Kitchen, I knew I wanted to try it! 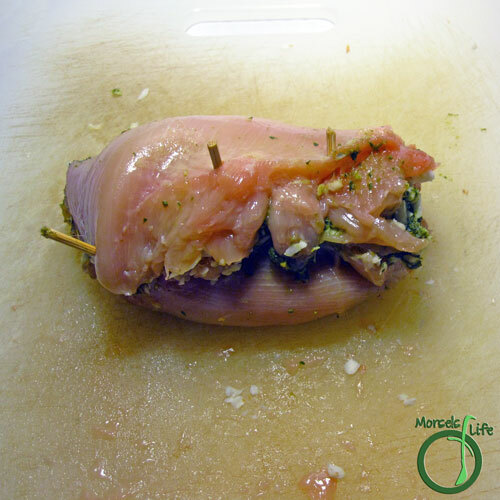 I got a bit nervous since I'd never stuffed a chicken breast before. The technique itself isn't difficult, although I definitely see it improving with practice. Pounding the chicken breast as thin as possible really helps since it'll give you more surface area to work with. However, I'm not sure if pounding or just cutting the chicken breast in half would be more efficient. I'm leaning towards cutting it in half, but it may be due to my inexperience. I'd never pounded a chicken breast before either. Even with all the new techniques I learned from this recipe, I'd still call it a success. 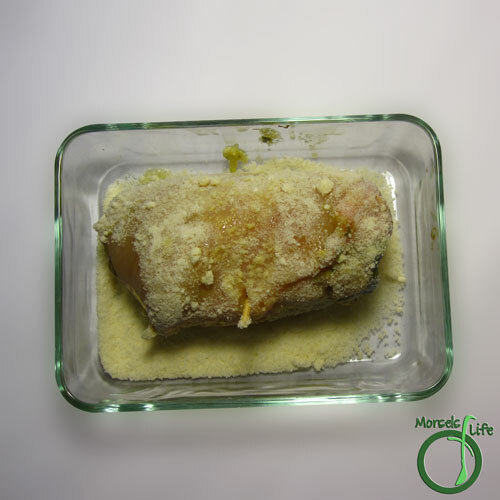 You get a crisp Parmesan crust over tender chicken surrounding cheesy basil pesto, and you really can't go too far wrong with those materials! 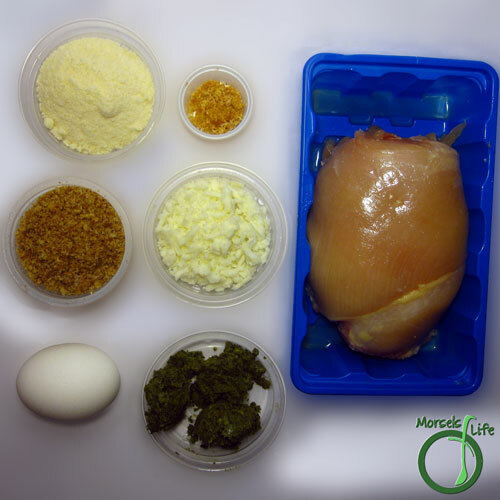 Do you have any hints or tips for making stuffed chicken? Pounding chicken? Share them in the comments! 2. 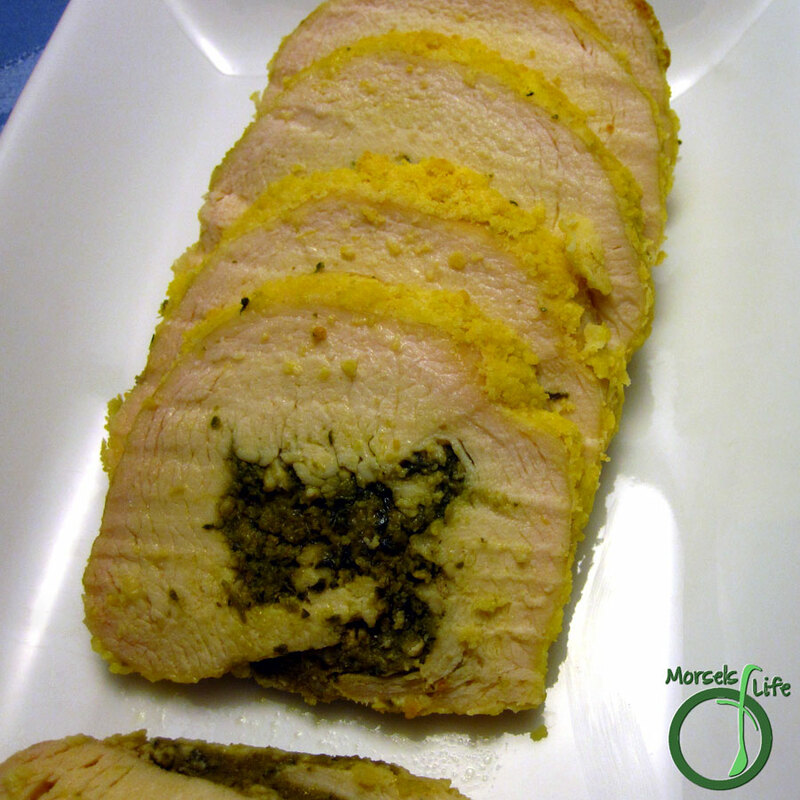 Spread pesto on inside of chicken breast. 3. 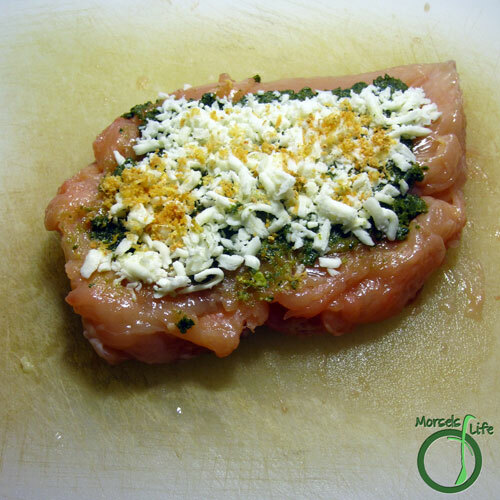 Sprinkle with mozzarella cheese and garlic. 4. 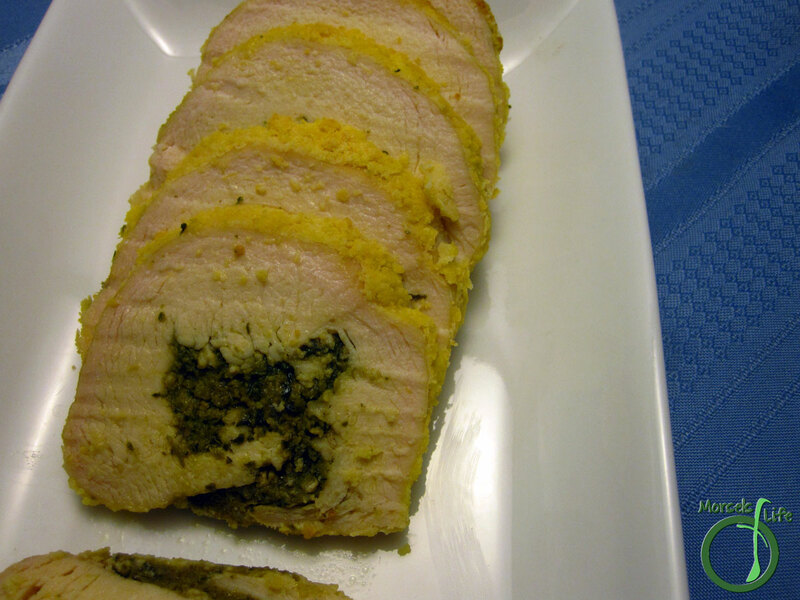 Roll up chicken breast as neatly as possible. Hold together with toothpicks or skewers. 5. Dip entire roll into egg, making sure all surfaces are well covered. 6. Dip in Parmesan cheese. 7. Shake off excess and bake at 375F until done. I'm so glad you spotted this recipe over at Kalyn's .. it sounds delicious. One more way to use up my stash of homemade pesto I have in the Freezer. Thanks for sharing. This looks like a delicious idea! 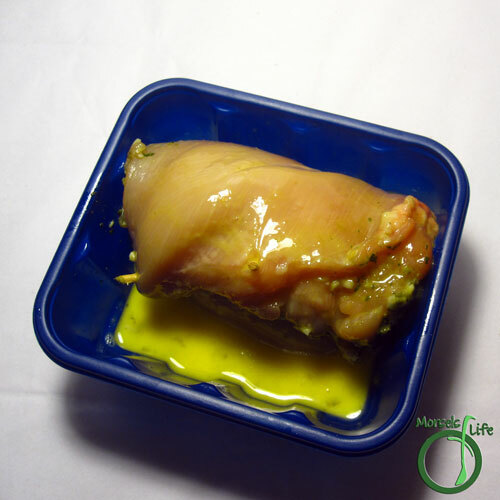 I've never actually made chicken stuffed with anything before because I didn't know how it was done! Thanks for enlightening me. Looks delicious! Thanks so much for linking up to Show Off Friday! Lovely recipe! I added sun dried tomatoes and proscuitto to the stuffing and it was lovely!! 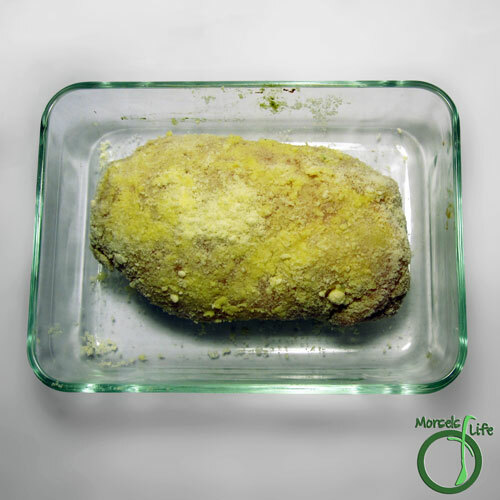 An entire chicken breast did proove to be too much, however - i used half a breast...otherwise the perfect recipe! This looks and sounds really good! Thanks for linking up with "Try a New Recipe Tuesday." I hope you will be able to join us again this week. Such a beautiful presentation! Looks like a great recipe. I love the pesto and chicken combination! Looks really tasty! We love pesto. Looks delicious CJ. Thanks for sharing at #WonderfulWednesday! Enjoy your week. This looks totally amazing! 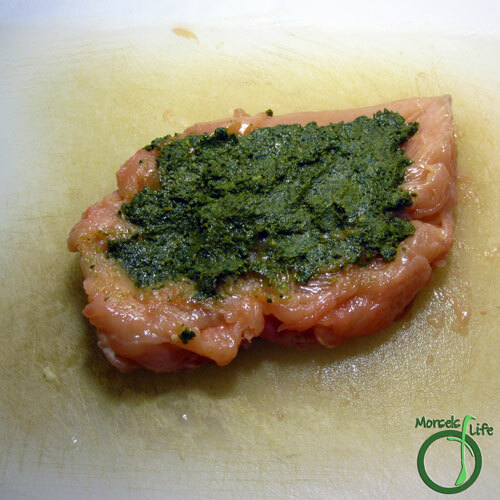 We love pesto so I am going to try this. Thank you for sharing at #OverTheMoon!